I know many of you avoid soy products, but I think it’s quite okay to include some fermented soy products in your diet. Asian cultures have been eating them for years. The real concern comes when you are already ingesting a large amount of soy found in processed foods. As long as you avoid processed foods, a little soy will not be a big deal. Since most soy products in this country are GMO, it is very important to look for soy products that have been non GMO verified. 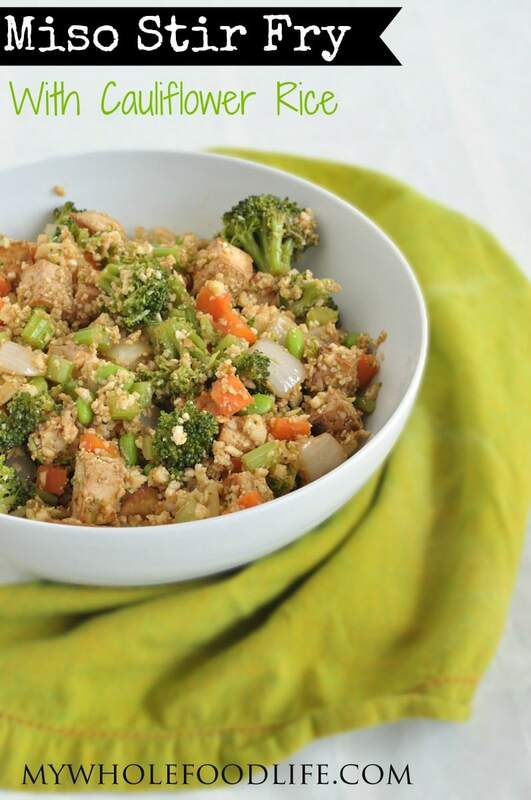 This miso stir fry with cauliflower rice was both delicious and filling. I added tofu to mine, but you could really use any protein you like in this dish. This miso stir fry was created by my husband. I came up with the idea, and he put it all together. He is way better with the savory dishes than I am. I wanted to do cauliflower rice again because I loved it so much in this dish. This miso stir fry may seem like it has a lot of steps, but you can make the tofu and cauliflower rice ahead of time. That is what I did. Mix the sauce ingredients together in a small bowl . Drain the tofu and pat dry. Cut it into cubes and place it on a lined baking sheet . Brush the sauce on the tofu. There will be some sauce left over that you will use in the stir fry. While the tofu is baking, you can make the rice. Put the cauliflower in a food processor and pulse until you get a crumb-like consistency. Be careful not to mix it too much because it can get mushy. Heat a large saucepan on medium heat. Add the cauliflower and a couple teaspoons of oil to the pan. Saute for about 5-7 minutes or until the cauliflower is slightly toasted. Set aside. Steam the broccoli for 10 minutes. In large saute pan, combine the carrots, onions, celery, garlic and sesame oil. Cook on medium heat for about 7 minutes. Once that mixture is done, put all the ingredients for the stir fry together with the remaining miso sauce. Stir fry for just a couple more minutes to coat the sauce evenly. If you don't like tofu, you can always use another protein. This should last a week in the fridge. I don't suggest freezing it though. 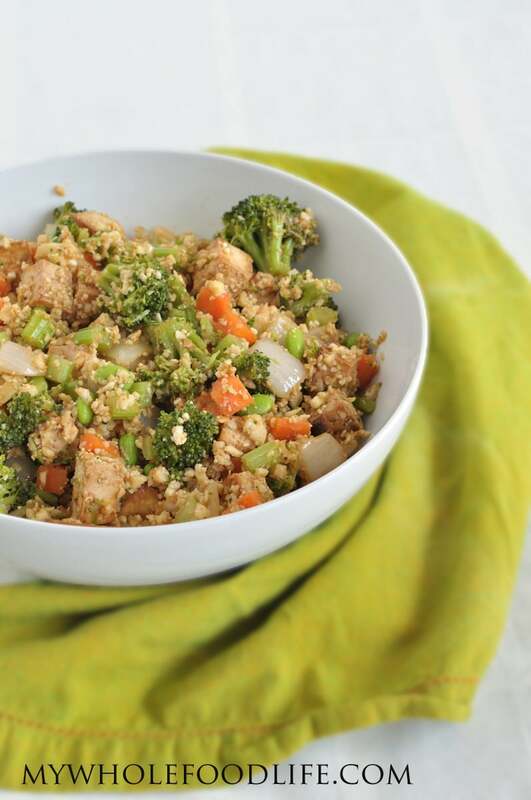 The recipe may seem a little involved, but you can make the tofu and cauliflower rice ahead of time. Enjoy! I also see celery and onions in the picture, but are not in the ingredient list. I also have never used Miso. Is that soy? Sorry about that. It's been corrected. Miso is a fermented soy paste. What could you replace the maple syrup with for a diabetic? You might be able to use a liquid stevia, but I am not sure how much. Where can you buy miso? Almost any health food store. It will be in the same section as the tofu. They have miso at trader joe's now! It's in the area with the hummus. I so look forward to your emails especially when I haven't planned dinner! This came at the perfect time for dinner tonight! Delicious, quick and easy! Every one of your recipes have been a hit at my house. Hello, I came across your blog and appreciated the recipe you shared. However, I was concerned by your statement, "The Asians have been eating them for years." To begin, Asians are a diverse group, and lumping them together seems insensitive to their diversity. Even more concerning , was calling them "The Asians" as if Asians are a foreign group eating exotic foods. Thanks for your time. I am sorry you feel that way. I meant no disrespect. How would you have worded it? I just finished making this for dinner and it's lovely! I love the cauliflower rice idea, such a versatile veggie. I can't wait to have this for lunch tomorrow. Thanks! Hi, I probably should just take a pass on this recipe but it looks so good! I must, because of the type cancer I have, avoid soy. Soy metabolizes to estrogen and my tumors feed on estrogen. I know it's asking a lot but could you possibly come up with replacements for the soy products in this recipe? If not, I totally understand and thank you for everything!